The Council on Foreign Relations is inviting its members only to attend this "on the record" event which it describes here. 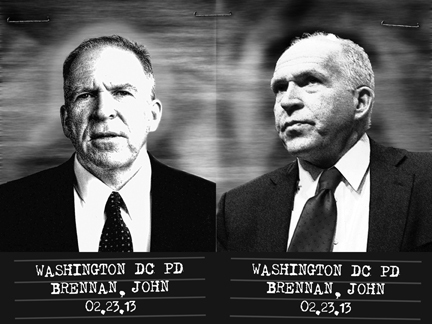 Central Intelligence Agency Director John O. Brennan will offer insights on how the CIA addresses the unprecedented array of complex challenges worldwide, including its role in building the intelligence capability of foreign liaison services to improve professionalism and enhance international security. Read about John Brennan here. We will protest outside against US terror drone strikes killing thousands of innocent civilians who are called "collateral damage." The US wars continue in Iraq and Afghanistan and beyond, destabilizing whole regions. Why are some lives considered, by those in power, more important than other lives? Why are some deaths considered tragic and others not? Sponsored by War Criminals Watch/World Can't Wait and NYC War Resisters League (list in formation).